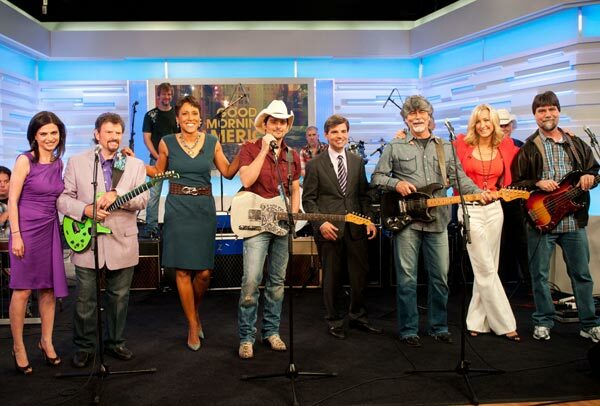 This morning Brad Paisley was special guest on ABC’s Good Morning America in support of his just released album THIS IS COUNTRY MUSIC. After an interview with GMA co-anchor Robin Roberts, Paisley along with supergroup Alabama, performed their #1 Billboard smash hit, "Old Alabama." (l-r): Brianna Golodryga, GMA Weekend Anchor; Jeff Cook, Alabama; Robin Roberts GMA co-anchor; Paisley, George Stephanopoulos, GMA co-anchor; Randy Owen, Alabama; Lara Spencer, GMA lifestyle anchor; Teddy Gentry, Alabama.